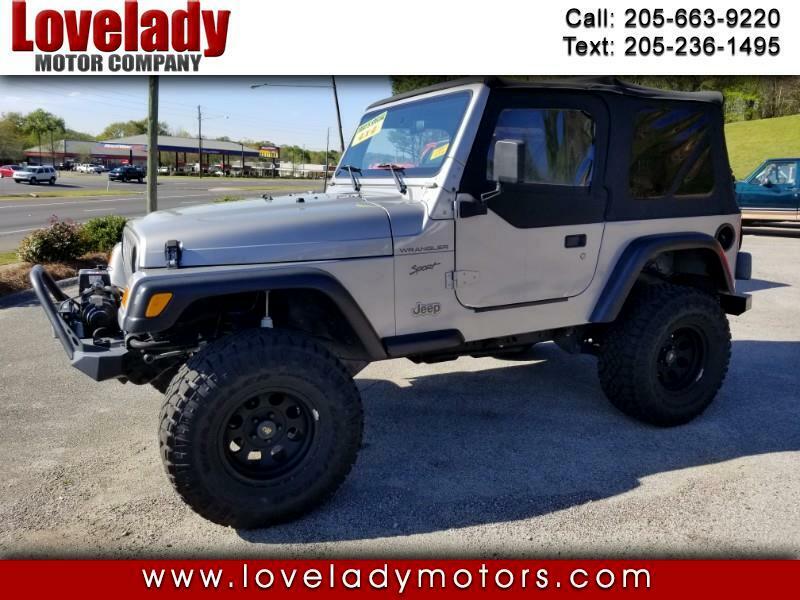 Used 2002 Jeep Wrangler Sport for Sale in Pelham AL 35124 Lovelady Motor Company, Inc.
Up for sale is a 2002 Jeep Wrangler Sport. It is equipped with the legendary 4.0L 6 cylinder engine that is mated to an automatic transmission. This Jeep also has many nice after market parts such as the 2" body lift 15" Pro Comp bullet hole style wheels, 33x12.50R15 Goodyear Duratrac tires, Poison Spyder front Rockbrawler bumper, Warn VR8000 winch, and more! The half doors are really nice during the summer and the soft top is in good shape. This Jeep has always lived in Alabama and only has 118k miles! Contact Stephen or Keith for more information! This Jeep was a recovered theft so it has a rebuilt title. This vehicle is sold AS-IS. This Jeep was a recovered theft so it has a rebuilt title.